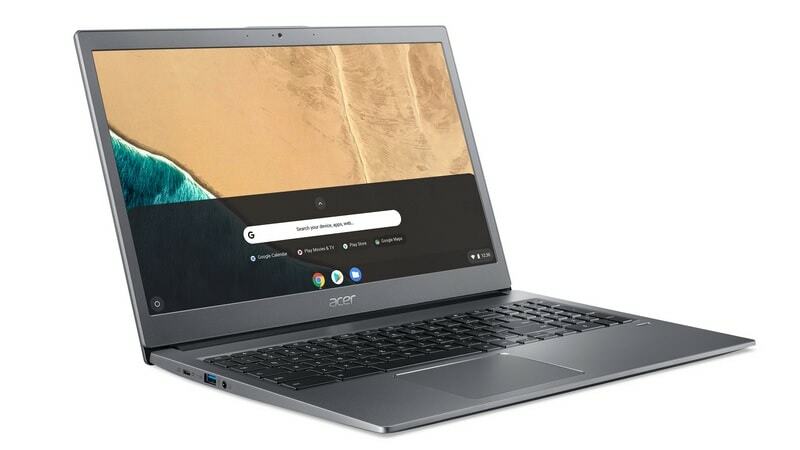 Acer has today launched a pair of new Chromebooks targeted at enterprise users, flaunting a sturdy metallic build, small form factor, Citrix certification, and fingerprint sensors among other features. The two new Chrome OS-powered computing machines launched by Acer at the company’s [email protected] event are the Acer Chromebook 714 and the Acer Chromebook 715. Both the Acer Chromebook 715 and Chromebook 714 can be configured with up to an 8th Gen Intel Core i5 processor and come equipped with USB Type-C v3.1 ports for charging and faster data transfer. There is a Type-C port on either side, giving users the choice of which side they want to charge the Chromebook from. The Acer Chromebook 714 and Chromebook 715 feature a shock-proof anodised aluminium chassis that comes with MIL-STD 810G durability certification. Both the new devices are claimed to be highly durable and impact-resistant, capable of withstanding drops from a height of up to 48 inches and vertical force of up to 60kg. The touchpad, on the other hand, is protected by a layer of Corning Gorilla Glass and is claimed to be scratch and moisture resistant. Both the laptops come with an integrated fingerprint scanner for added security. Additionally, the Acer Chromebook 715 and the Chromebook 714 duo come with Citrix certification for compatibility with a wide range of networking and cloud computing solutions. Moreover, the Acer Chromebook 715 also holds the distinction of being the first Chromebook to feature a full-size numeric keypad, and features a backlit keyboard. Talking about hardware specifications, the Acer Chromebook 715 comes equipped with a 15.6-inch full-HD (1920×1080 pixels) IPS display, while the Acer Chromebook 714 packs a smaller 14-inch full-HD (1920×1080 pixels) IPS display with slim bezels (6.18mm). Both the laptops will be available in variants with a touch and non-touch sensitive display. The Acer Chromebook 715 and Chromebook 714 can be configured with up to an 8th Gen Intel Core i3 or i5 processor. Lower-end models powered by Intel Celeron and Pentium Gold processors will also be made available. The storage capacity varies between 32GB, 64GB, and 128GB of eMMC storage. Both the devices come with support for Google Chrome Enterprise solutions as well as the Play Store’s library of Android apps. When it comes to ports and connectivity, both the new Acer Chromebooks feature a USB 3.1 Type-C port on each side, as well as a USB 3.0 port and a microSD card reader. Wireless connectivity is handled by Bluetooth 4.2 and dual-band Wi-Fi 802.11 a/b/g/n/ac. In terms of battery life, Acer claims that the Chromebook 715 and Chromebook 714 will last around 12 hours on a single charge. Coming to the pricing and availability part, the Acer Chromebook 714 will start at $549 (around Rs. 38,000) for the base variant with 8GB of RAM and 32GB of internal storage, and will go on sale in North America in April. It will also hit the shelves in the EMEA region carrying a starting price of EUR 549 (roughly Rs. 43,000 ) the same month. A 16GB RAM option is also available. As for the Acer Chromebook 715, it will go on sale later in June starting at $499 (around Rs. 34,000) in North America, and will retail at EUR 599 (roughly Rs. 47,000 ) for the base variant (8GB RAM, 32GB storage) in the EMEA region in April. However, the availability of variants will vary depending on the region. A higher-end variant with 16GB of RAM will also be made available.